Air Hogs Zero Gravity Laser Follows Red Dots, Could Be Confused By Heavy Sniper Activity | OhGizmo! 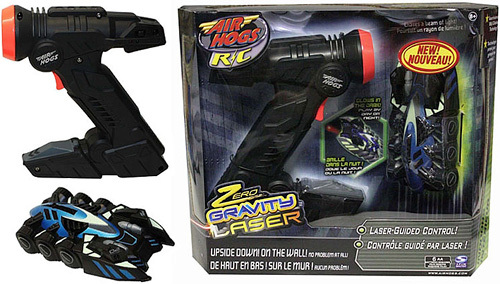 Just a heads up if you were thinking about picking up one of these new Air Hogs RC toys for your kids and happened to be the target of multiple would-be assassins. Their new Zero Gravity Laser is controlled by shining a laser dot in front of the vehicle which will automatically follow it, whether it’s racing around on the floor or defying gravity by driving on the walls. So if your home is constantly bombarded with red laser dots from distant sniper rifles, there could be issues, I’m just saying. $49.99 from Toys”R”Us Canada.